Hello. Welcome to our Site. Need Directions to our Nashville Store? Click here . Patch on the neck with moti and abla work on it, along neck and centre panel. 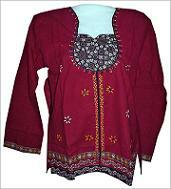 Maroon kurta with white attached jacket and white readymade dhoti.